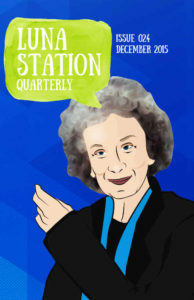 The Dark Half of the year is upon us, and Luna Station Quarterly follows suit, wrapping up our sixth year in style, with stories that chill and thrill, from an amazing assortment of women. Alongside the usual compliment of uplift & wonder that you’ve come to expect, there are bittersweet stories here; of a girl who is transformed into a tree after rejecting a god, of a cloak that delivers vengeance at a cost, of a woman whose strained humanity causes her to fly into a black hole. Zelda Fitzgerald even shows up along the way! C’mon… now you KNOW you’re curious!